Smash cakes seem to be the new thing for a youngster’s birthday, a small round cake that the kid can dive into and get messy with. 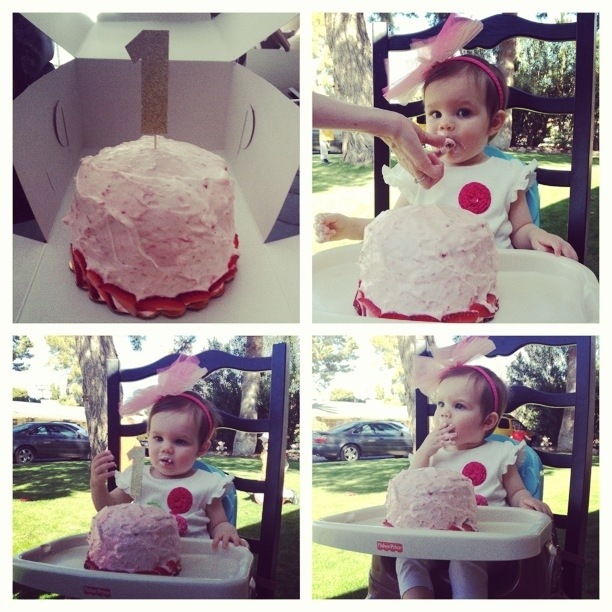 I had a request this past weekend to bake a smash cake and cupcakes for my favorite 1 year old’s birthday. I went with a classic vanilla cake with fresh strawberry icing, recipe below. In addition, I made a number “1” topper for the cake. Cut out the number 1 on card stock paper, paint with Mod Podge Glue and sprinkle with gold glitter. Once that dries make sure you do a coat of Mod Podge over the glitter, this seals the glitter so that it doesn’t fall onto the cake. Then hot glue the number to a toothpick. If you live in the Phoenix area and like to bake I highly suggest you check out ABC Cake Baking Supply Store. They have everything you need from baking pans, decorations, cookie cutters, boxes, etc. Last week was my first time to the store and I was memorized by all the stuff they had. Preheat oven to 350 degrees. Butter and flour a 5-by-3-inch cake pan, tapping out excess flour. In a medium bowl, whisk flour, baking powder, baking soda, and salt. Fill pan 3/4 full with batter; smooth top. Bake until cakes pull away from sides of pans, 50 to 60 minutes. Let cool in pans 10 minutes. Run a knife around edges of pans and invert cakes onto a wire rack. Let cool completely. Baker’s Note: This recipe makes enough for the smash cake and about a dozen cupcakes. Also, when it came to the cake I did the toothpick rule when testing to see if it is ready. Using a mixer, cream the cream cheese and butter until nice and smooth. Add the vanilla extract and pureed strawberries. Gradually add the powder sugar until it has the consistency and sweetness you desire. You can alter this to your liking. If you make it a bit too sweet, add just a little bit of lemon juice. This will help balance out the sweetness. Baker’s Note: I realized after making this that it is a icing rather than a frosting, the consistency isn’t as thick as traditional frosting.